In mid-April, Penn’s resident string ensemble, the Daedalus Quartet, played the final concert in its ambitious yearlong exploration of Beethoven’s 16 string quartets [“Arts,” Nov|Dec 2017]. In the Orrery Pavilion at the Kislak Center for Special Collections, Rare Books and Manuscripts, listeners were invited by the program notes (slightly edited here) to ponder a question that may have teased audiences two centuries ago: Who does this composer take us for, anyway? In 1798, Beethoven produced his first six quartets. He had moved to Vienna six years before, and studied composition there with Antonio Salieri. He also took lessons with Franz Josef Haydn, although their personalities didn’t quite mesh. Vienna had recently been submitted to a deluge of quartet masterpieces. Mozart, shortly before his death in 1791, wrote several for the King of Prussia, a cellist. Haydn would continue to churn out quartets, adding to an already staggering collection. While no one would have accused the 28-year-old Beethoven of faltering with Brahmsian modesty when contemplating quartet writing, the demand (perhaps self-imposed) for the young star to produce nothing short of a masterpiece must have weighed heavily upon his shoulders. And so we find that the Op. 18 quartets are generally pretty large in scale and rife with references to the past and present masters, but determined to boldly go where no man had gone before. Op. 18, No. 2 might come across as an homage to Haydn. It is filled to the brim with Haydn’s sparkling wit. The first movement, with its polite gesturing and humorous outbursts, brings to mind a comic opera. The second, in ternary form, is a beautiful melody, stated twice, with a whirling dance in between the statements. The third, a scherzo, never touches its feet to the ground until the trio. The last, in sonata-rondo form, is a puckish romp through key after key. 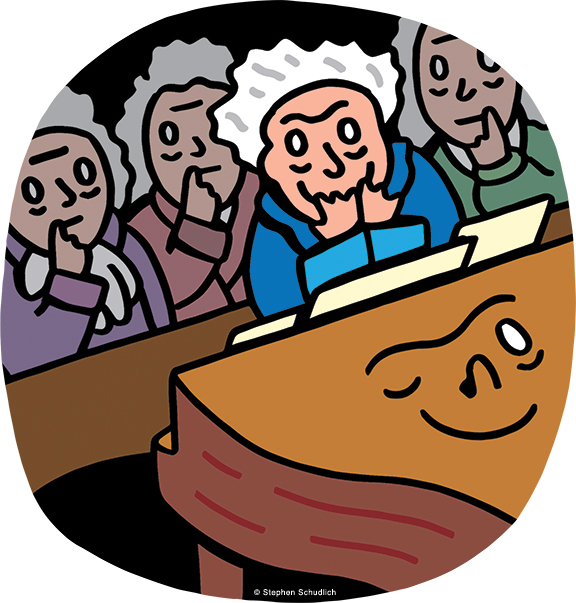 Does any of this—opera, long melodic lines, weightlessness, puckishness—sound like Beethoven? It is certainly not what we hear in our heads when we stare at his frowning portraits. Nevertheless, beneath the music’s bright surface we can detect rumblings of something else. First of all, it sounds worked-over in a way that Mozart’s and Haydn’s music does not: this elegant humor didn’t come naturally to Beethoven. But the main question is how firmly Beethoven’s tongue was inserted into his cheek. The piece isn’t just witty, it’s WITTY. Characters are so defined that they hint at parody. And this edge gives the piece another dimension: we are impressed by all the fireworks and delighted by all the grace and humor, but underneath it all we have the sneaking suspicion that we are being mocked for our lace and pearls. And there, laughing behind the sophisticated stage set of his deception, we find the Beethoven that we have come to love.